Skin injuries like cuts often happen so fast that you often don’t have time to stop and think about how to properly treat them. Knowing the first steps to take when you get a cut can prepare you for those instances when you or someone you know has a skin injury that needs to be assessed and treated quickly. This article will guide you through the steps of figuring out how to best treat a cut. First and foremost, you need to 1) control the bleeding and 2) prevent infection. If you are bleeding, apply firm pressure to the wound until it subsides. Then, to keep the area clean and protected from bacteria that could cause infection, use a product like GCP Pre- and Post-Procedure Cleanser or another antibacterial cleanser and then apply a topical antibiotic like bacitracin or mupirocin. Cover with a bandage such as a Bandaid. One the cut is under control, you need to consider what you were cut with. 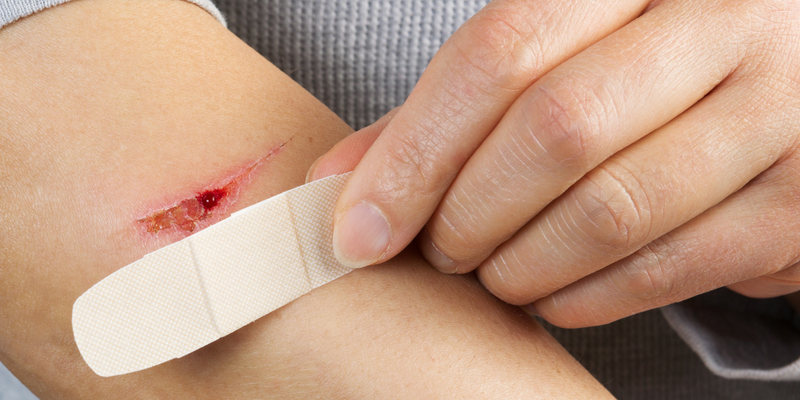 If you were cut or injured by something dirty like a rusty nail, piece of wood, or animal bite, then you are much more likely to get an infection. In this case, you should go to the ER or urgent care because you may need a tetanus shot or antibiotics. You may be familiar with the term “cat scratch fever,” which is a very real infection that can occur after being scratched or bitten by a cat infected with Bartonella henselae bacteria. Even though about 40% of cats are infected with this bacteria at some point in their lives, most cats show no signs of infection. This makes it difficult or impossible to tell whether or not your cat could be infected. For this reason, any time you are scratched or bitten by a cat, you should immediately clean the wound and watch for symptoms that may develop. If you are bitten by a dog, you could be at risk for infection, tetanus, or rabies. If your skin is punctured, you should seek medical care to avoid and promptly treat, if necessary, these issues. Although most domestic dogs are now vaccinated for rabies, this disease needs to be treated immediately to prevent it from becoming more serious and even life-threatening. If you can, ask the owner of the dog for its rabies vaccination information. You may also need to get a tetanus shot if yours is not current. If the injury does not break the skin, clean the area as described above, and then watch for signs of infection like pain, pus, and redness. Tetanus is a type of bacteria that lives in places like soil, dust, and manure. The most common example of a tetanus infection is when a person steps on a rusty nail. However, it is not the rust itself that causes this infection. Usually, rusty objects have been exposed to dirt and other particles that could contain this bacteria for long periods of time, making them high-risk objects. In the U.S., tetanus is rare, thanks to vaccination programs. However, if you have never had a tetanus vaccine or are not up-to-date on your 10-year booster, you could be at risk for tetanus infection and should seek medical attention if you are cut by a dirty object. How Large Is the Cut? If you were cut by something like a kitchen knife or sterile needle or scalpel, the main question would be whether or not you need stitches. Cuts that are 1mm less in length are much less likely to scar and will generally not need stitches. If your cut is longer than 1mm, it is the depth of the cut that will determine if you need stitches or not. Injuries that appear to be flayed open or are 4mm – 5mm in depth will most likely require stitches. Since it can be very difficult to tell how deep a cut is, it is best to go to the ER or urgent care for a professional opinion if you’re not sure. Replace the bandage and antibiotic ointment once a day or any time it gets wet. Do not pull off the scab; let it heal completely. Once the scab comes off, you can stop using the antibiotic and bandage, but apply a physical sunscreen over it every day. After about three weeks, if there is a pink mark, consider getting a Vbeam laser treatment to prevent or improve the appearance of the resulting scar. Any time you’re unsure of the severity or risk of infection of a skin injury, check with a medical professional to be on the safe side. Once you’ve been checked and/or treated for infection and other possible complications, proper wound care at home can help to speed up healing and minimize scarring. If you do end up with a significant scar, talk to a board-certified dermatologist about the best scar treatment. If you still have questions about treating cuts or scars, contact Baumann Cosmetic at info@derm.net. You can also follow us on Facebook, Instagram, and YouTube for more skincare tips and advice.